We are a little bit obsessed with homemade pizza at our house! And by obsessed I mean we make some almost every weekend! We have our favorites of course, like Barbecue Chicken Pizza, classic cheese, and this Garlic-Ranch Chicken Pizza which I’m so excited to share! 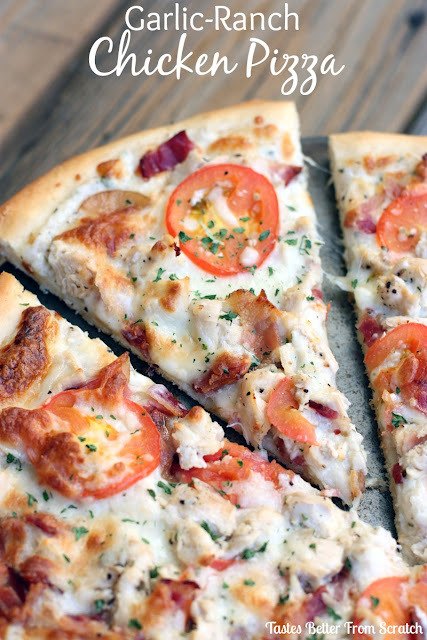 It has a deliciously easy homemade sauce and all of the toppings I love–tomatoes, chicken, bacon, and mozzarella cheese! It’s delicious! !